When the action during the first act of this Shakespeare Center of Los Angeles production was interrupted due to an ailing theatergoer, Hanks took to the boards, good-naturedly waving his sword at viewers, “ordering” them back into their seats and so on. Hanks’ improvisational panache saved the moment and in that hallowed show biz tradition, eventually the show went on, performed under the stars at the West L.A. V.A. Campus’ Japanese Garden. (Although the delay added time to the play’s already three hour-plus length, putting me in mind of the title of Orson Welles’ 1966 Falstaff film Chimes at Midnight). 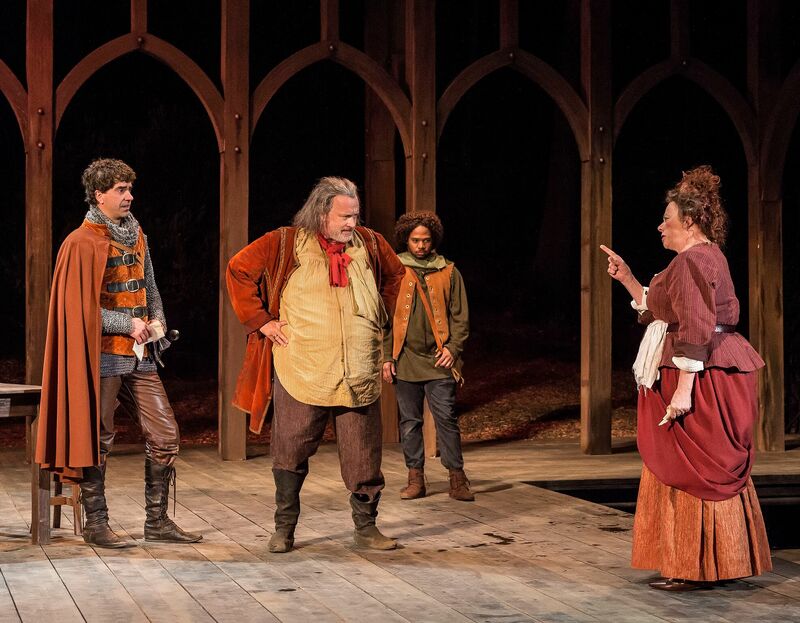 Hanks’ merry- and mischief-making Falstaff is bosom buddies (sorry, I couldn’t resist!) with England’s much younger heir apparent, Hal, Prince of Wales (Hamish Linklater, whose stage credits include the Public Theater’s Shakespeare in the Park, plus acting onscreen in Fargo, 42, etc.). Their friendship is based on cavorting, carousing and playing pranks upon one another that makes life seem like one big pub crawl. But these whoring, drinking habitués of the Boar’s Head Inn are ensnared and drawn into decidedly serious civil wars that rock the British Isles in what could be described as Shakespeare’s comedy-drama. It’s surprising to see what happens to Prince Hal and Falstaff’s much-vaunted, tavern-based friendship at the end of the second act. But your reviewer won’t disclose this to Shakespeare virgins with a plot spoiler. However, with its intrigue and faction fights, it’s extremely interesting to view this drama set in Britain during the early 15th century from the vantage point of 21st century America, wherein Trump is pitted in mortal combat against the “deep state” and so on. At times, with the Henrys (father and son) pitted against Henry Percy, nicknamed Hotspur (Raffi Barsoumian, who also has, like other cast members a dual role, as he plays Pistol, too) and fighting other pretenders to the throne, Shakespeare’s history seems similar to the conspiracy-minded TV series Morton co-starred in as covert action chief and Olivia Pope’s (Kerry Washington) father Eli Pope in Shonda Rhimes’ Scandal. Henry IV also has some great battle scenes, choreoed by fight director Steve Rankin, as Bolingbroke goes for broke to protect his reign and realm. This SCLA production’s outdoor setting is reminiscent of Manhattan’s Shakespeare in the Park, but in a much smaller venue with 620 padded but cramped seats. A stage was constructed on the meadow at The Japanese Garden on the West Los Angeles VA Campus by a veteran workforce with a simple, mostly bare set, with a backdrop of wooden Gothic arches. The area’s stream, waterfall, bamboo, etc., make for lovely surroundings - and there is another rarity in L.A.: free parking. Among the other notables who trod Henry’s boards is Harry Groener (Steven Spielberg’s Amistad, About Schmidt) as Northumberland and Justice Shallow. It is truly wonderful that despite presumably taking a major cut in pay, screen stars pursue their art with live theater. Although to be fair to Tom Hanks, 40-plus years ago his professional stage debut was in The Taming of the Shrew and he performed at a Cleveland Shakespeare festival for three seasons. Hanks went on to act on Broadway and the big and little screens, emerging as a Jimmy Stewart of our times. Director Daniel Sullivan skillfully helms the rather large cast of this stellar Henry IV. We live in dire, troubled times and great works of art such as the Shakespeare Center of Los Angeles’ Henry IV, the Wallis Annenberg’s Long Day’s Journey Into Night starring Jeremy Irons and Will Geer’s Theatricum Botanicum’s Coriolanus by Shakespeare help to make our lives (and L.A.’s traffic!) more bearable. Due to the location of the movie/TV capital here, we Angelenos are lucky to have superstars of screen appear on our stages. But if you want to catch Henry IV, don your spurs and hurry, because there are only 24 performances before it will be gone with the Windsors. 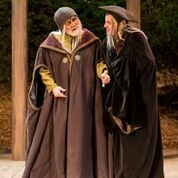 Henry IV is being presented by The Shakespeare Center of Los Angeles (SCLA), under the artistic direction of Ben Donenberg, at The Japanese Garden on the West Los Angeles VA Campus through July 1. 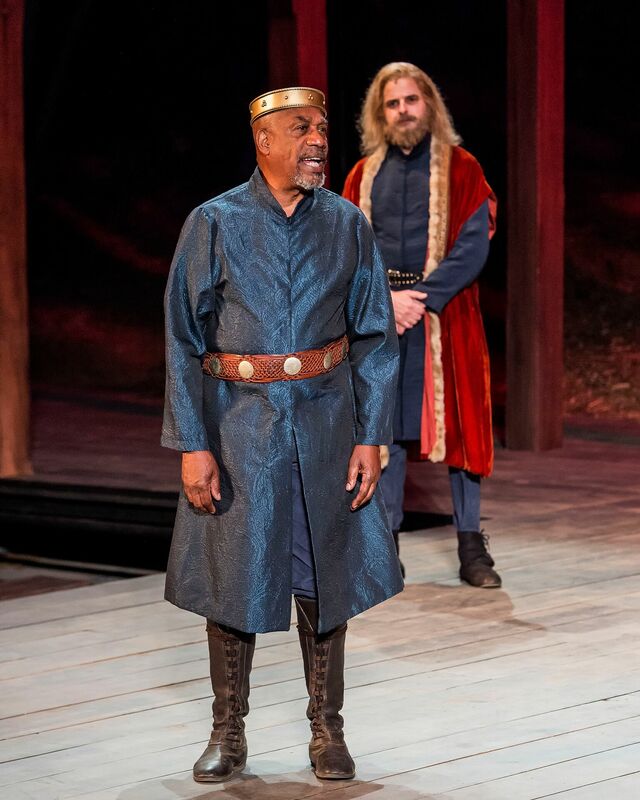 Info: https://www.shakespearecenter.org/.